It's been a game of hide and seek in our household for the past month or so. My better half has been playing music jobs left and right, on top of his day job. I, on the other hand, have been buried in the studio either shooting and editing until early evening, hoping for an evening when we can just chill. There have been a lot of "just changing clothes and heading out! I love you!" and "I won't be home for dinner" exchanged. Well, even with our motto of "doing things independently together", there are those moments when the in passing "love you" needs to turn into a long hug, a conversation. A sit down and a cup of coffee. A date night. Whatever it is that makes it worth it. There are so many nights with a single plate on the table, so many girls night out or in, so many chick flick marathons that one can take before the string starts wearing thin. My best way to fix that is to pack some food, a blanket, our kite and our fishing rods and head to the beach. A picnic. A moment that we create. I started planning some of our favorites to take along. A Salmon & Quinoa Salad, a big bottle of lemonade, and to finish a cross between a Pavlova and Eton Mess. 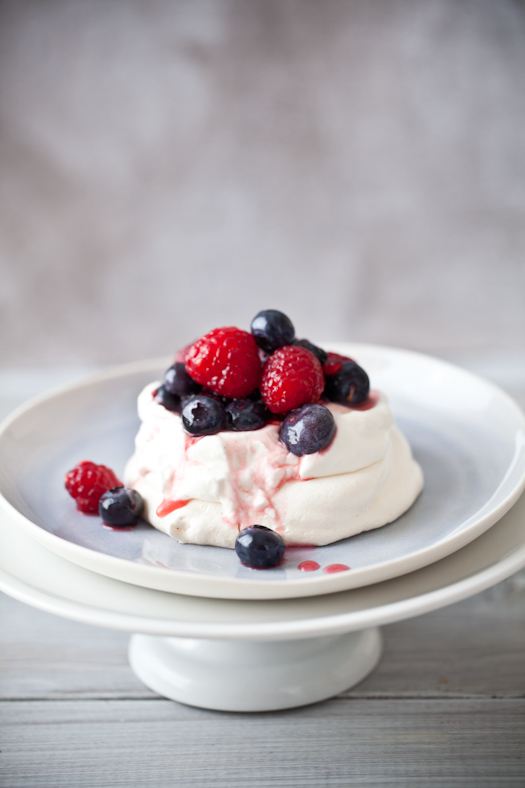 A Meringue with Creme Fraiche and Berries. 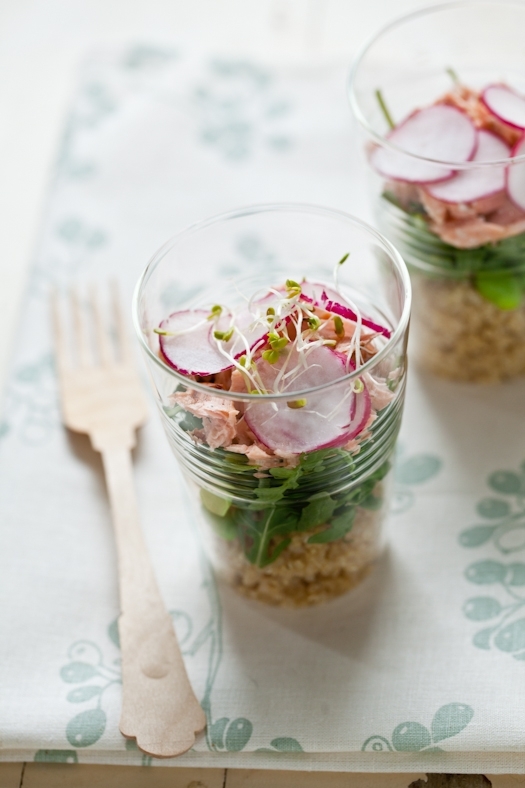 Something healthy and light and something completely decadent but just as light to the palate. I was about to put all our victuals in the car when the sky became black and thunder rolled up its big drums. Within minutes, it started pouring. So much for a picnic at the beach. Well...c'est dommage (too bad) but I was not going to let this one day off together slip away. 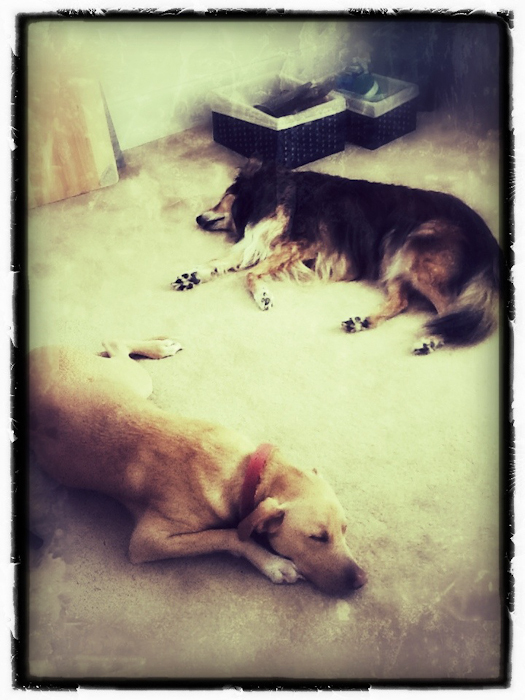 I pushed the furniture in the living room, spread our picnic blanket on the rug and laid out our meal. We sat there, with the pups sleeping soundly, listening to the sound of the rain and feeling grateful for this one little moment alone. And...grateful to be only steps away from the kitchen to go for seconds...! And on a final side note: if you are in Charleston or plan to visit soon, the opening reception of my gallery show at Heirloom Book Company will take place Friday March 2nd from 5.30-m til 8pm. The exhibit will run from now through the end of the Spoleto Festival. 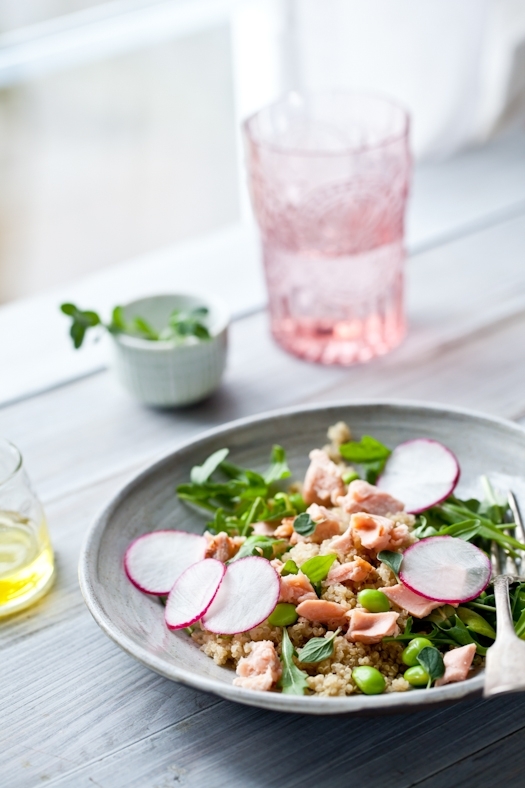 In a large saucepan, combine the quinoa, water and oregano. Ad a pinch of salt and some cracked pepper. Bring to boil. Reduce the heat and simmer until the quinoa is translucid and soft. Remove the oregano and garlic. Let cool. In a sautee pan heated over medium high heat, add a teaspoon of olive oil and cook the salmon for about 3 minutes on each side (longer if the fillet is thick). Season with salt and pepper. Remove from the pan and let cool. 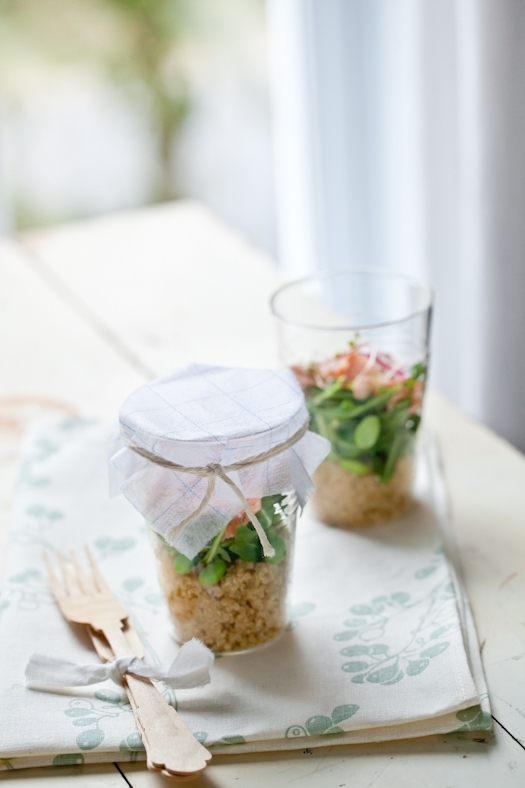 Assemble the salad by dividing the quinoa arugula, edamame, radishes, and salmon among plates (or cups that you can place a lid on if traveling). Drizzle with olive oil and vinegar to taste. Note: Start this dessert the day before you serve it. The meringue needs to sit in the oven overnight (off) and the homemade creme fraiche requires you start it the day before you assemble the dessert. It is so easy, I wonder why I don't make it more often..oh yeah... not as calorie free as it tastes! You can purchase your own creme fraiche if you wish. Place the heavy cream in a non reactive bowl. Stir in the buttermilk. Cover with plastic wrap and let sit on the countertop overnight. The next day, refrigerate until ready to use. 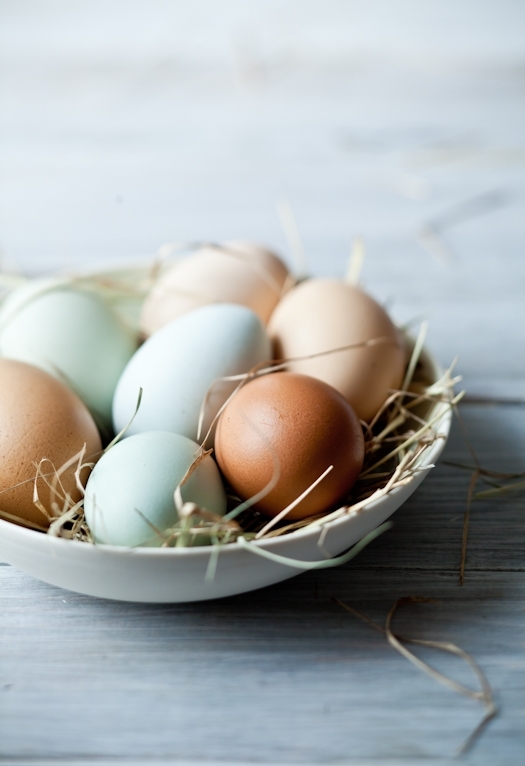 In the bowl of an electric mixer, whip the egg whites to a thick foam at medium speed for about 3-4 minutes. Slowly drizzle in the sugar, a few tablespoons at a time until the meringue is stiff and glossy. Line a cookie sheet with parchment paper or a silpat and form circles of meringue with about 1/4 cup of the batter for each. You can make them as thin or fluffly as you wish, smaller or larger. Mine were about 3 inches round. Place in the oven, turn the oven off and leave them overnight. 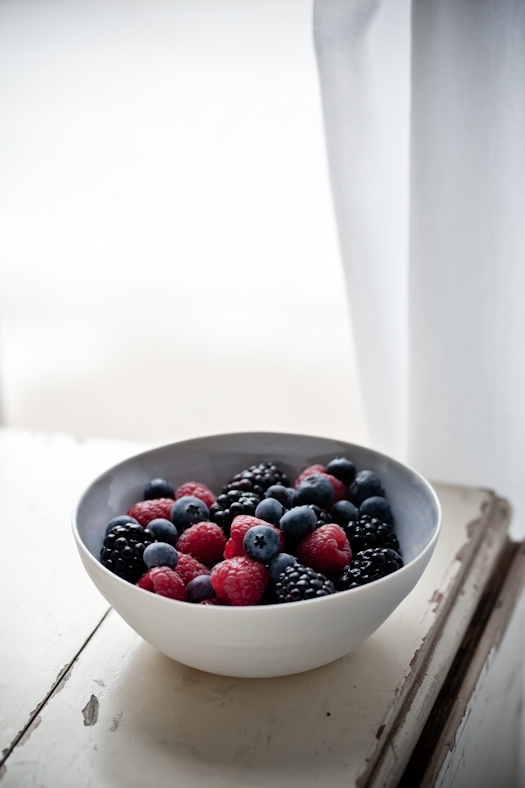 Mix carefully all the berries together with the honey and lemon juice. Reserve until ready to use. Place a meringue round on a plate. Whip the cream fraiche for a minute to fluff it up and spoon some on the meringue. Top with the berries and drizzle with some of the juice they gave out while sitting. 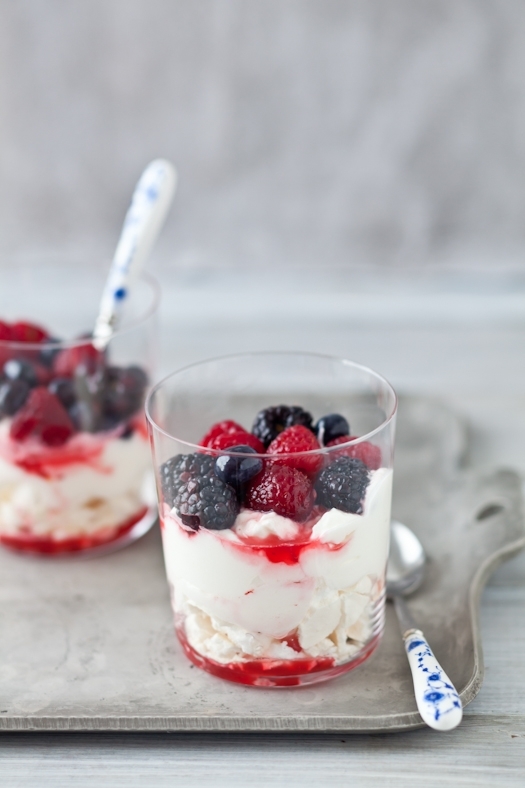 You can also, layer the meringue, creme fraiche and berries in glasses and pack them up in your picnic basket. To say that it has not really been good "soup weather" around here this winter would be an understatement. We have spent more days in short sleeves and sandals than in sweaters and boots. Granted South Carolina has a sub tropical weather year round and we do joke that we have two seasons, Hot and Hotter also called Humid and More Humid. Yet, February is a month we all look forward to as it usually offers a bit of a chill, a couple of weeks of fireplaces burning, of hoodies and gloves. Not this year. I can count on both hands the days I wore a sweater and on one those when I put my coat on. And boy do I love Winter. I grew up in an area of Provence where the Mistral wind often blew stronger in the Winter time, giving way to clear and chilly skies. Here the winds unmistakably bring thunderstorms or clear warm days. If I want a Winter mood, it is up to me to create it. Soup will put me in an instant winter cozy mood. But here obviously, soups cannot be only for cold grey days. I grew up with my mom serving soup every dinner before the rest of the meal but I did not really continue that habit once I moved away on my own. Instead, soups of all kinds became standard lunch fare at the house. Piping hot a few times but mostly warm or room temperature to be able to taste every bit of subtleties in the marriage of the vegetables used and their dance on my palate. 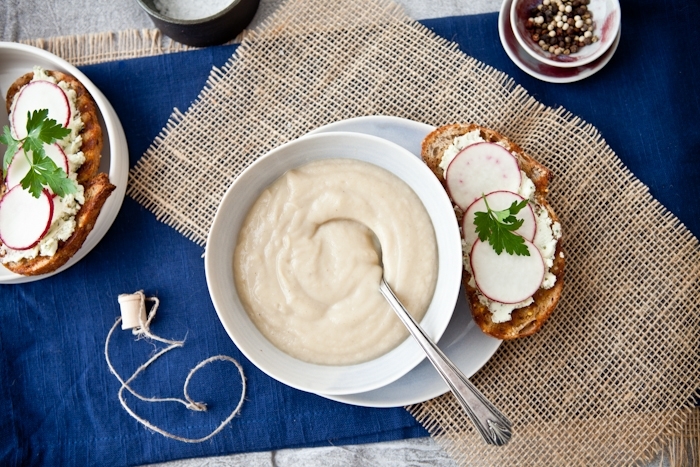 This soup is no exception to my rushing to lunch time every day. I am not much of a breakfast eater and I usually work straight through lunch but comes 2pm and my stomach wants to jump hoops and make loud cavernous noises until I settle it down with a little something. I find the most satisfying lunch to be a big cup of soup and a tartine these days. I can sit down, catch up on the news around, satisfy my hunger and recharge my internal batteries with the minimum fuss and the most gratifying bowl of goodness. I usually start a big pot of soup while I cook other things for dinner or as soon as I get up and start production on my shoots for the day. The smells wrapping up or kicking off a day at work are tantalizing enough to make me wish for that first spoonful with great anticipation. This soup has been made three times in the last ten days. We just can't get enough of it. My friend John who is a chef at my favorite restaurant downtown, reminded me that most of the vegetables I used for it were what we call back home "les légumes oubliés" or heirloom vegetables. 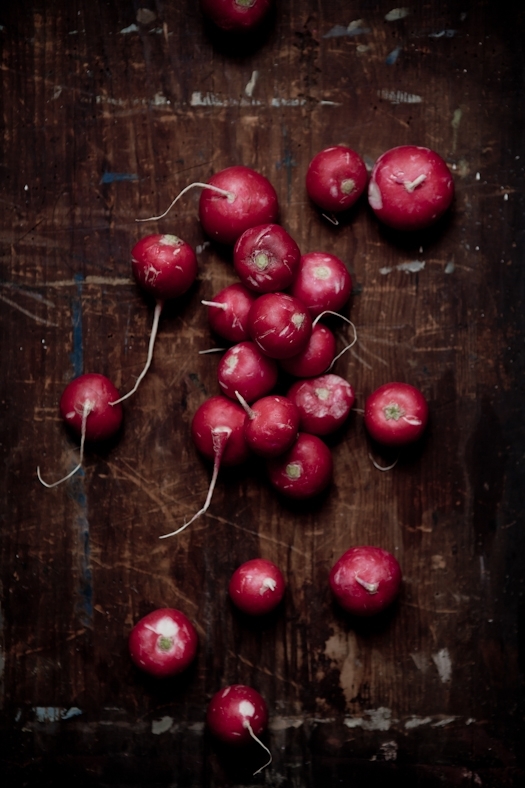 Vegetables that are finely and firmly coming back on menus and dinner tables all around. 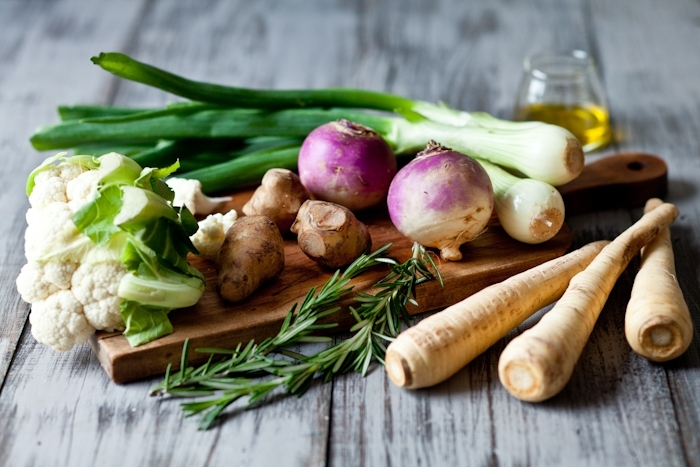 Sunchokes or Jerusalem Artichokes (topinambours), parsnips, turnips. I added Vidalia onions, cauliflower and a bit of rosemary to round up the flavors. Served with a slice of grilled bread smeared a bit or goat cheese mixed with plenty of herbs and topped with a few slices of radishes and it was the perfect lunch. Preheat oven to 375F and position a rack in the middle. Trim the outer leaves from the cauliflower head. Cut in quarters, remove the core, and cut the cauliflower into medium size florets. Place on a large baking sheet. Peel the garlic and place on the baking sheet with the cauliflower. Trim the white part from the green stalk of the Vidalia onions. Keep the white part and cut into medium sized chunks. Wash well under water and place also on the baking sheet. Finely add the sunchokes, turnips and parsnips to the same baking sheet. Drizzle with the oil, salt and pepper. 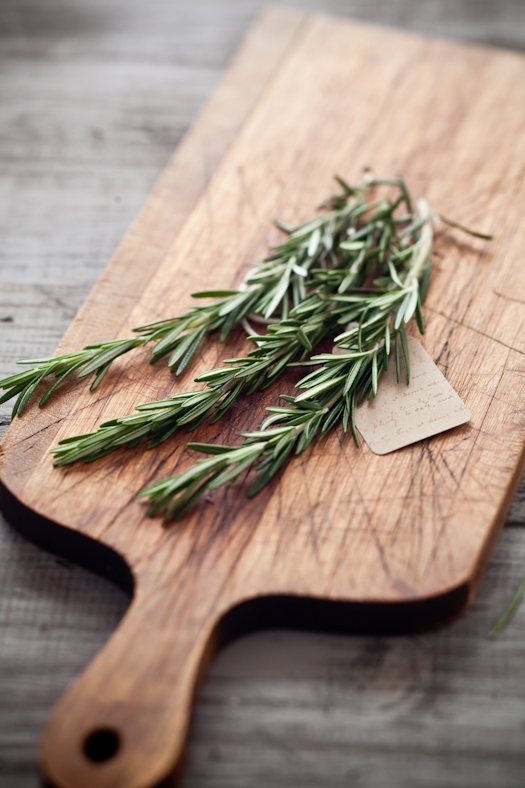 Place the rosemary on top and roast for about 20-25 minutes. Remove the rosemary. Let cool slightly. 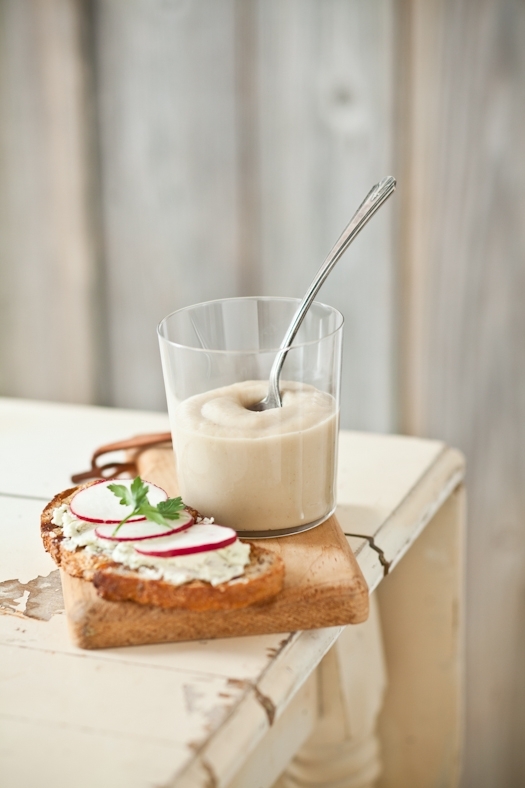 Place in a food processor, start running the machine and add enough water to have a creamy soup. Re-season if necessary with salt and pepper. 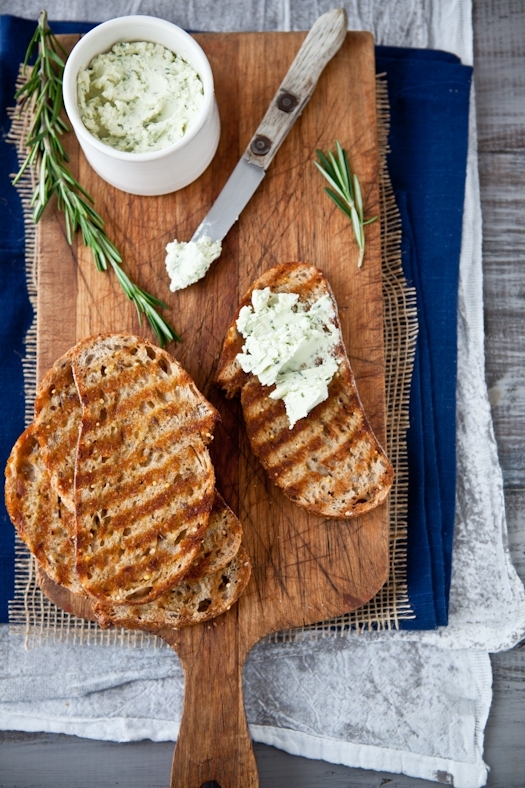 Serve with the herbed goat cheese tartines. Grill or toast the bread and set aside. In a small bowl, mix together the goat cheese and herbs until well blended. 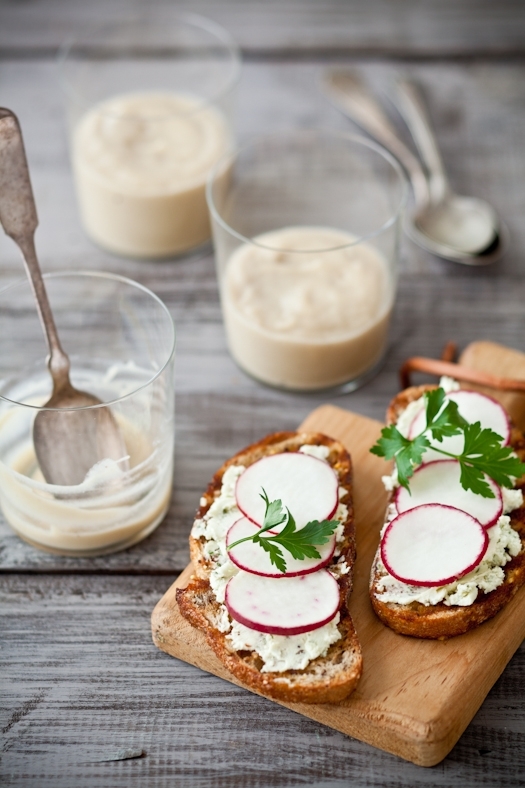 Spread some of the goat cheese mixture on the tartines, top with some radish slices. Husband (giddy): yay...macarons! What kind? Me (matter of fact): they are filled with mascarpone and a bit of membrillo left over from the shoot the other day. Husband (amused): did you make them for Valentine's Day? Me (in my best Mrs Patmore impersonation): why on earth would I do that? Me: well you know what I mean. We don't really do Valentine's Day here so I did not make them for that. Specifically. I made them for you. Specifically. Me: dude! It's been 14 years we haven't cared much about that cheesy holiday and "awkward!-I forgot-a-card" day. So why push my buttons about it now? Him: no reason. I just love seeing you scrambling...and I like to push your button. Specifically. Fast forward to this morning. I did get him a card. And he did give me one. We were both at the grocery store yesterday and stopped by the stationary. I started flipping through the fun card and one made me giggle. So I got it. He did the same. They were fun cards. They made us giggle. And that will be the extent of our Valentine's Day (he's got a gig tonight). I am not going to be the one whining about all the pink hearts and red cupids. They might burn a whole through my skull today too but I might have gotten softer in the last few years. Indeed, I am pretty sure I don't dislike V-Day. I don't like it either. I hate the pressure it adds for people in new relationships or in rocky ones. I like that it can give someone the wings to make a first step or to get someone out of the dog house. Why doesn't it phase me more than that? We are happily and giddily married. We don't wait for February 14th to extend a nice gesture, to add a nice words, to exchange a card (I often tuck one in his bag before work). But I dig the idea of an extra hug, an extra "I love you" and a extra kiss. Most of all I like the idea of taking an extra minute to be grateful for my husband's love and generosity towards me and my family. Similar to Thanksgiving, we don't wait for that day in November to be thankful for the things we have and enjoy, for the people we love and who love us back. Just like on Thanksgiving, today I said an extra "thank you" to Bill for the wonderful person he is to me. I did it yesterday. But I might forget at some point some day next year, next week. And I'd be silly to pass on an extra hug today. Anyday. It does not have to be a dozen roses, a fancy card or a box of chocolates. Or it might. Whatever makes one feel and be a little extra kind today. I can rally behind that. An extra bit of kindness had never hurt anyone. It would probably make the world go a little rounder too. So here is my virtual extra hug and "thank you" today for your love and generosity towards this blog and what I share with you. 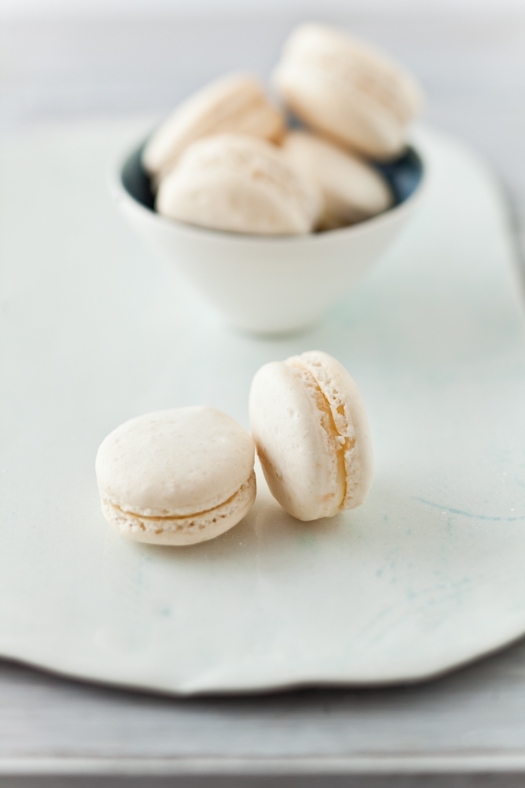 Notes: I can't post the exact recipe used for the membrillo (a.k.a quince paste) used to fill these macarons since the recipe is from a book not yet published (next Fall). But I would direct you to Simply Recipes post on membrillo which I have made several times with great success. Place the powdered sugar and almonds in a food processor and give them a good pulse until the nuts are finely ground. Sift if desired (helps keep the shells smooth in appearance). Fill a pastry bag fitted with a plain tip (Ateco #807 or #809) with the batter and pipe small rounds onto parchment paper or silicone mats lined baking sheets. 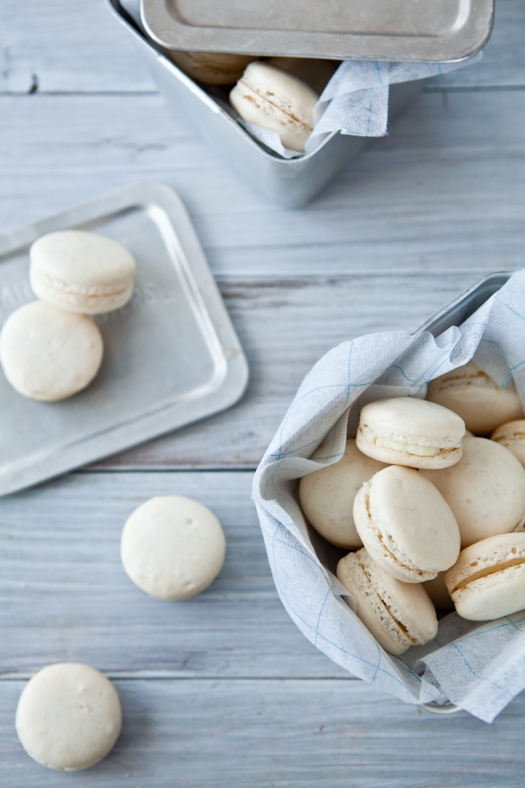 Let the macarons sit out for 30 minutes to an hour to dry their shells. Follow recipe on Simply Recipes. 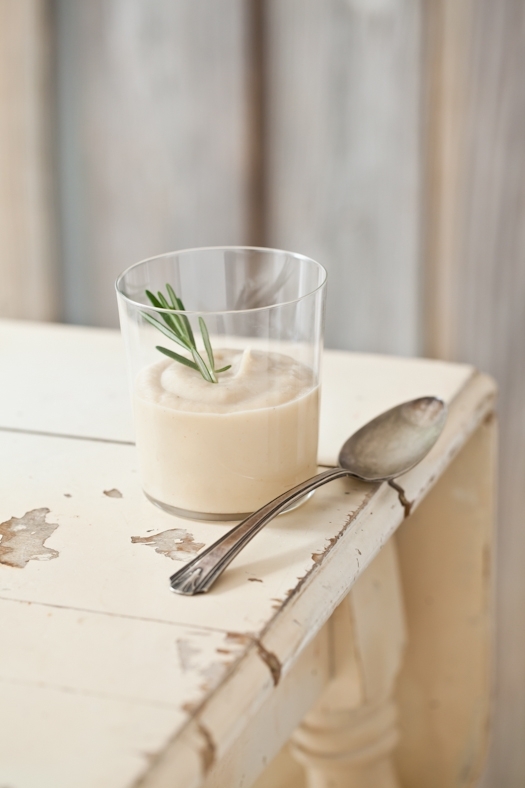 In a large bowl, whisk together the mascarpone and sugar until smooth. Add the vanilla and the heavy cream and whisk until all the ingredients are incoporated. 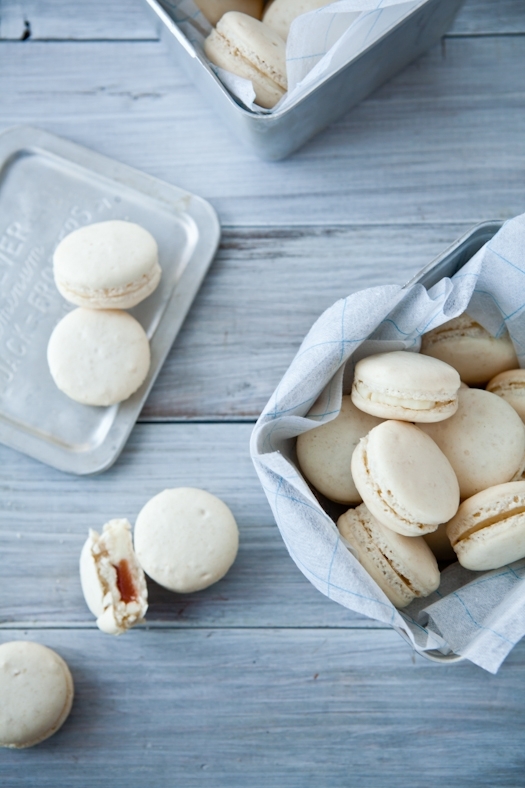 Place the mixture in a piping bag fitted with a plain tip and pipe a dollop of cream onto half of the macarons. Top with a square of pate de fruits and another macaron shell. It's the little things that make me happy. Not just smiling. Truly happy. The little things that instantly make my eyes sparkle, my memories ramble and my step take a lighter beat. A wine my grandfather served me on my last Christmas home that I spot on a menu in a restaurant downtown. The sound of the foam bubbling away after a cold beer is poured too fast in a glass. The crack of a spoon hitting the burnt sugar crust of a freshly made creme brulee. Opening a book at the very first pages, heart and mind ready to dive in, wrapped around with words, images, and possibilities. Lifting one's head after a day at work and be greeted by the most beautiful sunset. Little pleasures. Finding them in all things around us. Sometimes, it can be as simple as seeing a familiar food from childhood. Like smelts. I know, weird... I think the guy behind the fish counter at the market thought I was mildly eccentric when my eyes grew wide open at the sight of freshly caught smelt in his display. The mere sight if these tiny little fish, bright of their silver and gold reflections, transported me back to my family's chalet in the Southern Alps of France. Every school holiday was spent there, skiing in the winter, hiking and swimming in the summer. Lots and lots of fishing too. It was a place meant for simple things. Like a dinner made of pan fried smelts and a big salad. Food did not define every waking moment of our time together. Being together around the table breaking bread and passing plates did. Cousins, uncles, aunts, brothers and sisters. Food was the excuse to be a family, to argue and make up. 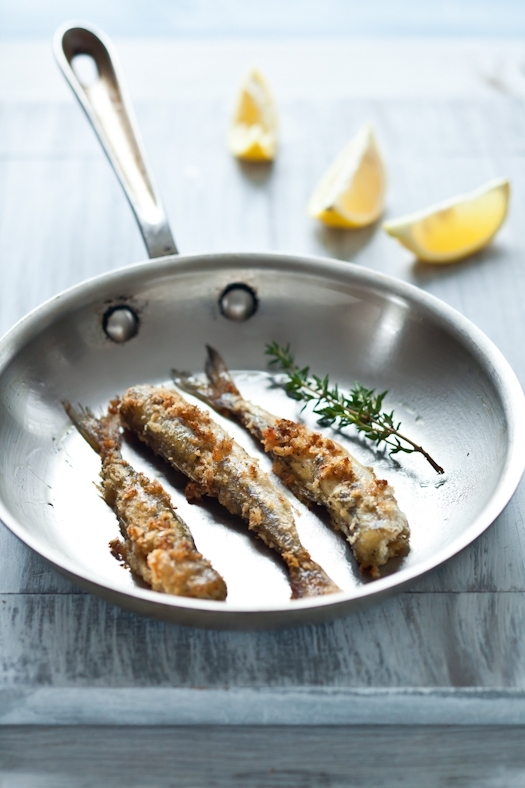 I remember my mother dipping the smelts in lemon juice, then breadcrumbs flavored with freshly cut herbs from the garden, and quickly pan searing them in a little olive oil. A good sprinkle of salt and pepper and we were good to go. The more people at the table and the bigger the pile of fish. And the bigger the sighs coming from the kitchen as my mom kept on cooking and cooking the tiny little things. 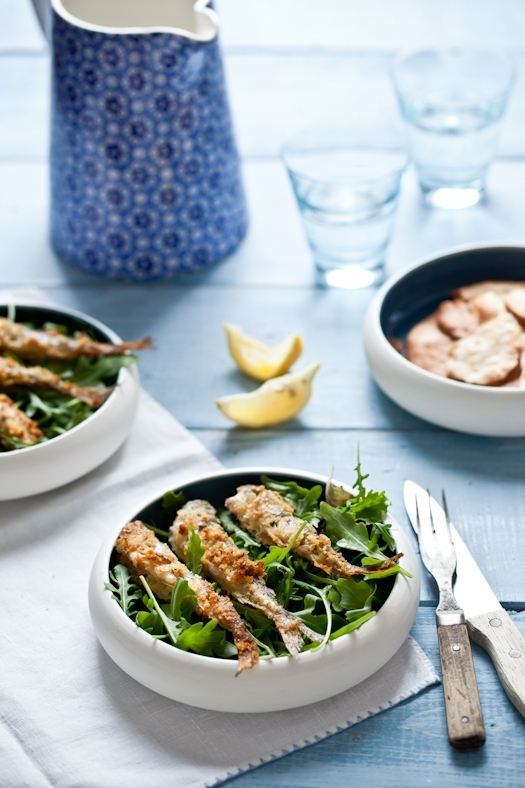 Pan seared smelts are not most refined dinner items but to me there are the heroes of family moments I cherish everyday. Hence the little skip in my heart when I spotted them at the market. I was sure not to find them again for a long while so I got more than enough for two dinners. I loved seeing my mom's eyes sparkle when I pulled a bag out of the freezer for us one evening. I knew instantly where her mind had wandered. I recognized that little smile at the corner of her mouth. I could imagine the memories going through her head. I pulled out a skillet and started preparing dinner. She set the table and told me a few stories. 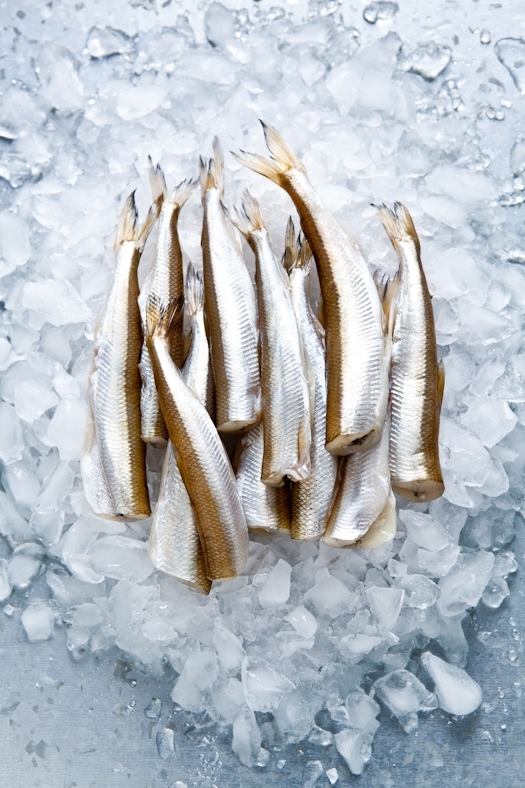 Rinse the smelts under cold water, dry thoroughly with paper towels. Reserve. Place the breadcrumbs, salt, pepper and thyme in a large shallow plate. Place the lemon juice in another shallow plate. Heat up one tablespoon of olive oil in a large skillet over medium high heat. 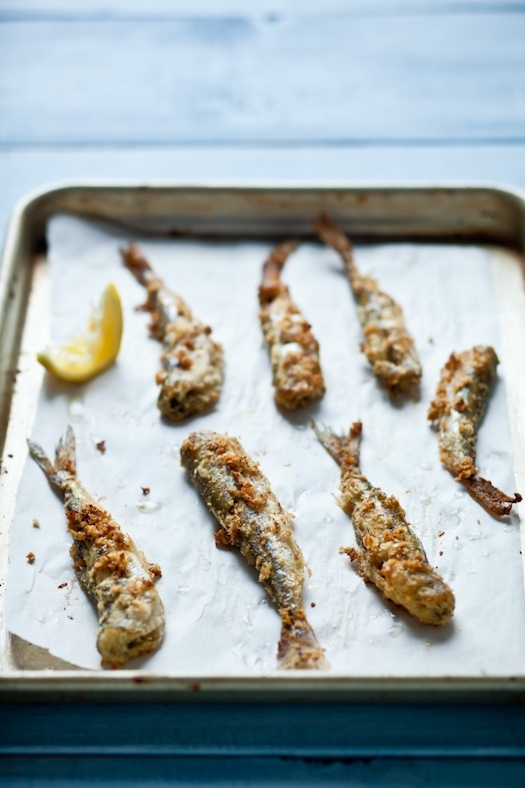 Dip about 1/4 of the smelts in the lemon juice, then toss in the breadcrumbs. Place them in the skillet in one single layer and sear for about 3 minutes on each side. 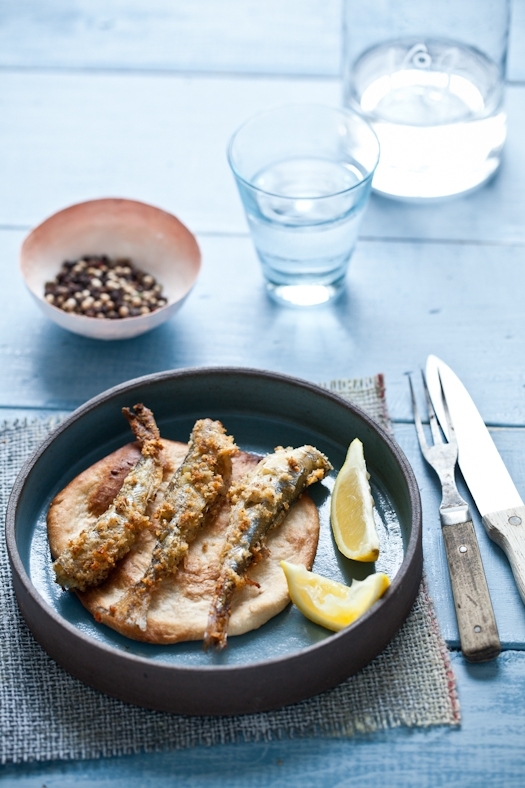 Repeat with the remaining smelts, lemon juice, breadcrumbs and oil. Serve immediately with a simple side salad. Studio wall with quick prints of the shots so far. Friday already. 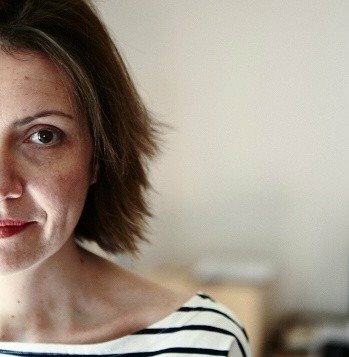 We are on the last day of the shoot for "Marmalade" by Elizabeth Field for Running Press (Fall 2012) and as usual at the end of every book shoot, I am a little sad, a little tired, and a little excited to see what project I get to work on next. And reconnect with the rest of the world. I truly enjoyed every minute of this shoot. 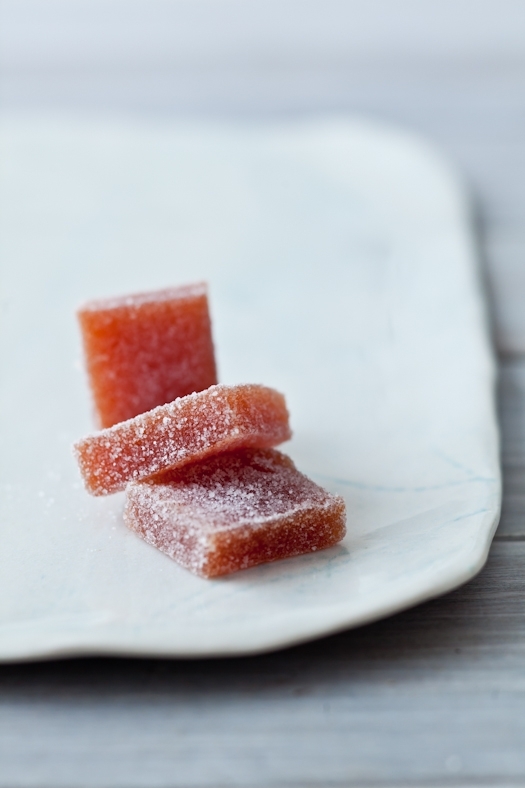 The marmalades and the sweet and savory recipes using them. Working through each shoot with focus to get that giddy feeling inside my stomach that we had the shot. 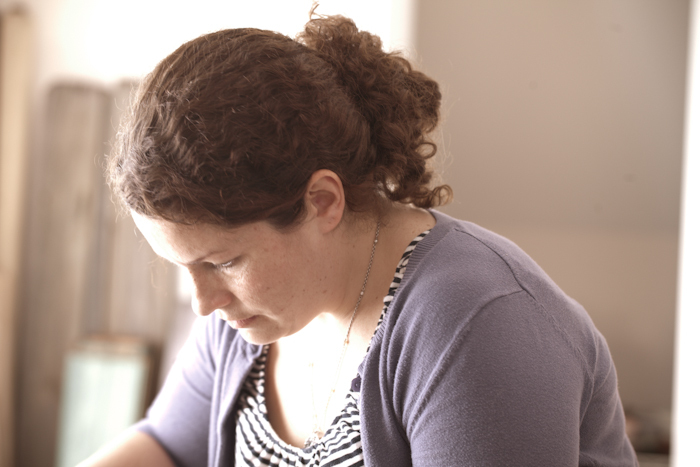 Amanda, the graphic designer for Running Press. 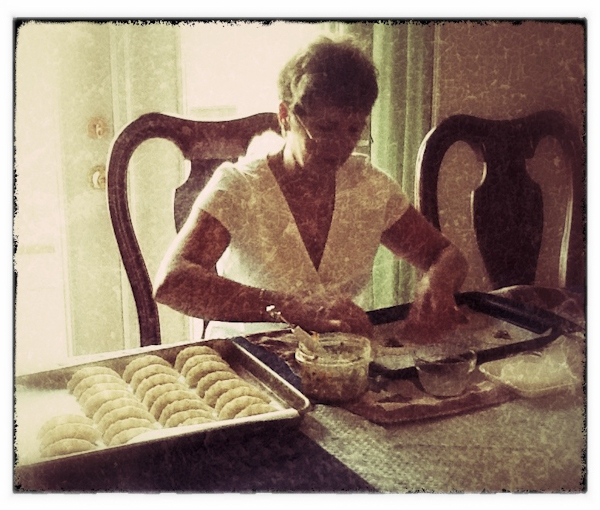 One of my kitchen assistants, Gilly, hard at work making Chinese Dumplings to go with a marmalade dipping sauce. 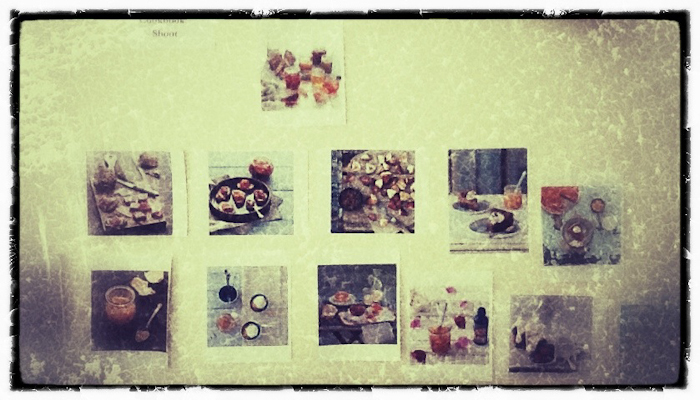 A cookbook shoot is a lot of things, little and big. Lots of minute details and large sketches. It's a lot of fun too. It's having the best group of kitchen assistants working through the recipes and tweaks needed. It's collaborating in the studio space with Amanda, the graphic designer for Running Press who had flown in for the week. And this time it was also sneaking in a hug from my mom in between two shots. My parents are leaving Sunday but I am glad they got to be here during a book shoot. They now realize the investment it is for me, both in time and dedication. 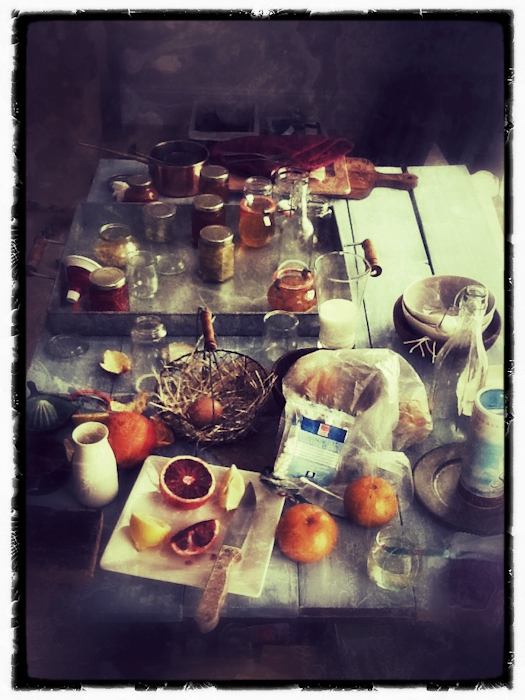 Plus, marmalades is one of their favorite subject so that shoot was really a propos! 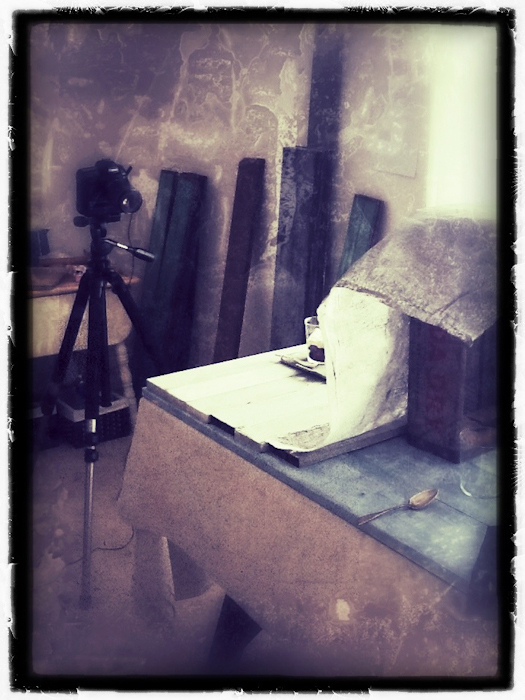 I leave you with some snapshots from the shoot while I go rest my head on the pillow for a few hours...!